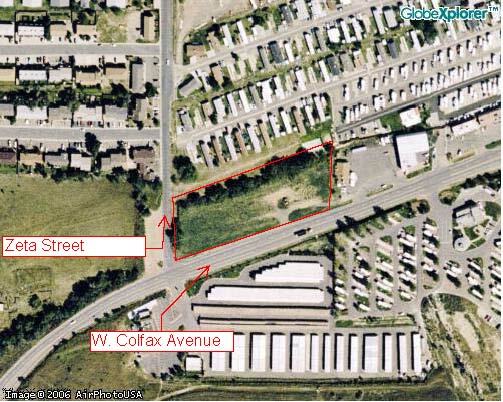 2.2 acres of corner commercial land for sale or lease with W Colfax frontage just west of C-470. Great development opportunity or potential build-to-suit. Available commercial property for sale or for lease and zoned for industrial, retail, church, storage of construction and landscaping materials, parking lot and event space among others. Zoned PUD with City of Golden C1, C2 and M1 uses included in the PUD. All uses allowed by Special Use Permit in the C1, C2 and M1 zoning district may be allowed subject to a Special Use Permit. No outdoor storage or self storage uses will be permitted by the C1, C2 and M1 uses. High visibility commercial land for sale with 15,342 cars per day traffic count.